With Black Panther and Avengers: Infinity War on the very near horizon, the Marvel Cinematic Universe is running full steam. One of the most exciting upcoming characters, though, is Captain Marvel. The Captain’s appearance in the MCU marks the bridge between the the universe’s third and fourth phases. We’re eagerly anticipating both her standalone film and her appearance in the yet-unnamed fourth Avengers film. Now, the first photos of Brie Larson in the Captain Marvel costume have leaked. They’re not exactly what people were expecting, but let’s slow down for a second. A quick dive into the comments will reveal responses like “Where’s the red?” and “That is not very flattering, at all.” But there’s a lot of reason to dig this suit and to not worry about the red-and-blue suit making an appearance. Let’s take a look. This could be a simple technical thing. Green is much easier to work with when creating visual effects, and it could be that the team wants to give the red and blue highlights an otherworldly look to match Captain Marvel’s cosmic powers. 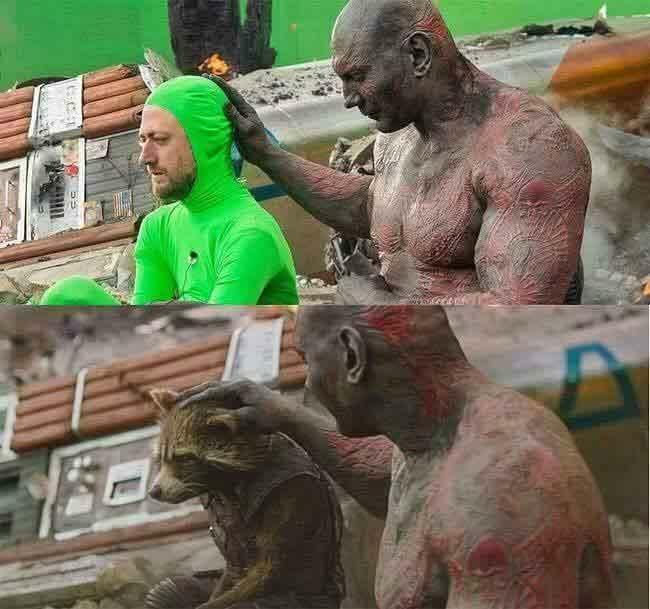 Dave Bautista wasn’t petting a literal raccoon in Guardians of the Galaxy – he was petting director James Gunn’s brother dressed up in a green-screen outfit. Emilia Clarke has never petted a real dragon because dragons aren’t real. Even color correction can have a huge effect on the way movies look, making a city street look green instead of grey or making a desert look eye-searingly orange. A lot can change in post-processing and editing. But there are some even better reasons. The good captain’s powers from from the Kree alien race, and the original Captain Marvel was Kree himself, and green is kind of their thing. 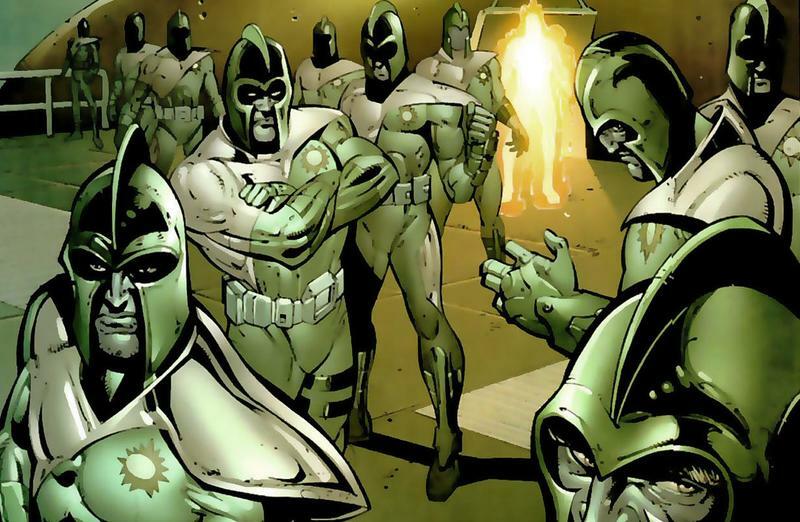 Danvers’ powers are likely from the Kree once again, and so it may be that her first suit is from them. Captain Marvel‘s eponymous standalone feature is confirmed to be set in the 90s. Check out that Rachel-esque hairdo Brie Larson is sporting. It seems almost a certainty that this sequence is from an earlier time period. By the time the Avengers meet the Captain, she’ll be at least two decades deep into her powers. We’re guessing the end of the first Captain Marvel movie has her trapped in the Negative Zone or going somewhere that lets her come back looking the same when she steps up for Avengers 4. MCU characters almost always undergo a costume change. For a quick reference, check out this infographic (source at the bottom of the image) that outlines the costume changes so many Marvel characters have been through. It’s a veritable fashion show. The graphic is huge and it doesn’t even account for every single Marvel hero. In other words, even if this is her primary costume for her first appearance, it likely won’t stay that way for long. Remember, as you look at this photo, that it’s a set photo. We’re not sure which movie it’s from for sure, which time period it’s from, and none of the special effects that will make it what it is have are present the way they’ll be in the movie. We’ll likely find out more about what Ms. Carol Danvers will really look like closer to the movie’s March 6, 2019 release date.